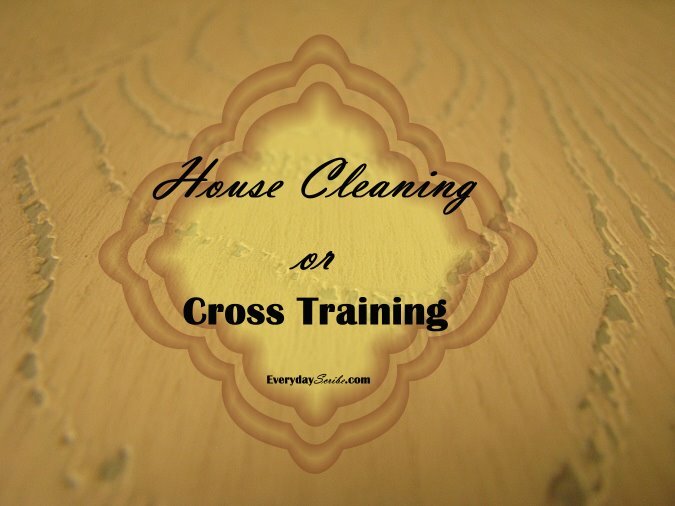 House Cleaning or Cross Training? If you are a runner and have run a race or 50, you probably get all kinds of emails from the organizers of those races. I get a lot. Most of them I ignore unless I think I want to run the race again, but the other day, one caught my eye. I’m not sure why, it didn’t promise to tell me anything I didn’t already know. But, for some reason, I opened it. It was about the importance of cross training for runners. If you aren’t into fitness or aren’t a runner, you might not know that it is really easy for runners to, well, run and only run. We often don’t allow time for building strength and flexibility in other areas of our bodies leaving us more susceptible to injuries or lopsided muscles (we have strong leg muscles but no arm strength). The email I recieved provided other exercises to do besides running. The author listed things like swimming or weight lifting, a lot of the same old, same old. Then she listed something I wasn’t expecting. She said the bending and stretching works muscles runners wouldn’t normally touch, so house cleaning was an effective cross training exercise. I often thought house cleaning was exercise (especially for me since I don’t always keep up on it), but when I read about it from an “expert” I gained a new appreciation for the dreaded chores I avoid for as long as possible. Today, instead of cleaning, I cross trained. I made a conscious effort to get the most out of every movement. I engaged my abdomen when lifting heavy objects, I lunged or squatted when picking up items, I stretched more than needed when reaching. The end result culminated into a fairly decent three hour workout. Now that I am an expert (you know, because I’ve done it once), here are my tips/ideas for when you are cross training a.k.a. house cleaning. Efficiency is not your friend. Not if you want to make the most out of your house cleaning efforts. I have quite a few stairs in my house, so I made a lot of trips up and down stairs. Usually I would collect things at the bottom of the stairs so I could carry up as many items at once. Today, I just took up items as I came across them. It was very inefficient, but I climbed a lot of stairs. I had a few items to take down to the basement and some of them were kind of heavy. When I carried them down the stairs, I held the item straight out in front of me instead of resting it against my body. This allowed me to not only work my arms and shoulders, but I could feel my abs engage as well. Vacuuming is great exercise. I always thought it was a good workout, but today I stepped it up a notch. Instead of just pushing the vacuum out and pulling it back toward me, I added a little lunge. I already step forward when I move the vacuum, so it was a natural progression to turn it into a lunge. When I needed to pick up something light off the floor or out of a low cabinet (like cleaning supplies from under the sink), I didn’t simply pick it up. Instead, I stretched down and touched my toes before picking it up. Similarly, I consciously stretched farther to get something higher even if it was within reach. These are just a few ideas I came up with today while cleaning. Keeping in mind that I wanted this to be a workout, not just a chore that had to be completed, made cleaning a little easier to bear. I am still not a fan, but at least this time I felt like I was doing more than just a thankless job that will have to be done again all too soon. Do you have ideas to share for kicking up your cleaning routine? I want to hear them. I’ll probably need more motivation for my next cleaning day…I mean….cross training session.